Augmented reality ad platform Blippar has raised $45 million in new funding from undisclosed investors and plans to build a visual search engine to tie in the technology. The company will use the financing to expand its engineering team and extend the global reach of its image-recognition capabilities. "About 90% of the funding will go toward scaling up the investment" to build out the new engine, per Blippar CEO Ambarish Mitra, who believes will create a new kind of cognitive behavior. Some of the brands working with Blippar -- Coca-Cola, General Mills, Procter & Gamble, Pepsi, and Nestlé -- have been testing and building out augmented reality and image-recognition campaigns featuring unique digital content and search. The engine will move brand campaigns into physical triggers on billboards, products, logos and magazine pages by using a smartphone to take an image of an inanimate object and overlay information on top of the physical image to create a new experience. The search works through the camera lens to provide augmented results. Someone walking down the street sees a building, a statue, or a piece of fruit, but doesn't know what to call it to perform a search. The object is recognized by taking a picture with the phone app. The search engine technology brings in relevant results, an overlay of information. "This is not a keyword search," Mitra said. "You are not using words. You are using images. The real connected world is about to begin." 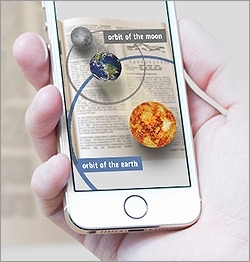 Unlike virtual reality, which takes the user into another world, AR provides a layer of information on top of the physical. Mitra found the need for this technology through working with some of the top brands in the world, and will demonstrate the visual search engine at South by Southwest Interactive (SXSWi) Saturday. The next version of Blippar will solve the problem of various lexicons and unknown words based on regions worldwide, such as the different between a coat and jacket or tennis shoe or sneaker.